I love this pan. It's great for all kinds of baking (like these sticky buns) with the convenience of a storage lid. This also works well for baking the sticky buns. It comes with a convenient lid to use when letting the sticky buns rise in the fridge overnight. Because this 10x15" dish is larger than a 9x13 dish or pan, and is the perfect size for inverting and serving the baked sticky buns. This 6-inch whisk is a handy size. I used it to combine the cinnamon and sugar. I use this versatile set daily for mixing, storing and serving. This size is perfect for making half a batch of sticky buns. The lid is great for making them ahead and storing them in the fridge or freezer. Use frozen bread dough to assemble in minutes. Can make the night before, let rise overnight, and bake in the morning. 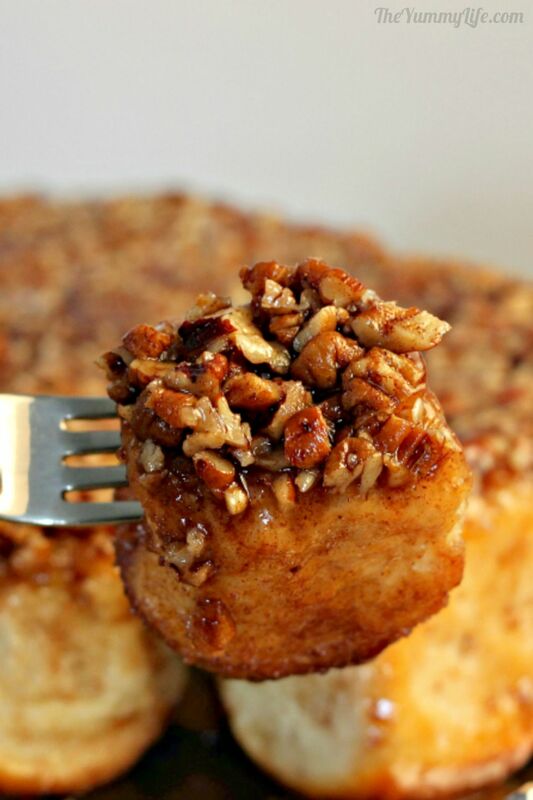 These gooey, delicious sticky buns are always a crowd pleaser. They take minutes to assemble using the convenience of frozen bread dough. Let them magically rise in the fridge for 1-2 days (seriously!) and they're ready to bake and serve hot and fresh. Perfect for Christmas morning breakfast. 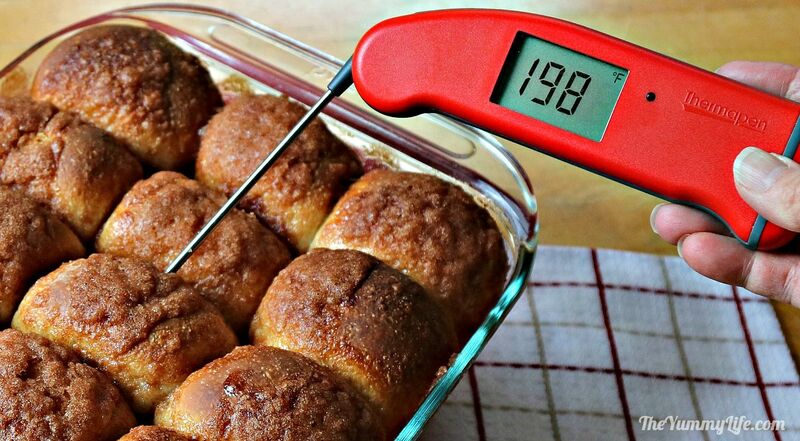 DONENESS TIP: For extra insurance that the center sticky buns are cooked completely, insert an instant-read thermometer half way down a center bun. The internal temperature should be 190-200°. Remove from oven, let cool in pan for 5 minutes and invert onto serving platter. Serve warm. 1. Assemble the night before, leave out to rise overnight (approx. 8 hours), and bake first thing in the morning. 2. Assemble 20-24 hours in advance, put in the fridge to partially rise. The next day, remove from fridge and allow to rise at room temperature for 2-3 hours before baking. 3. Assemble 44-48 hours in advance, put in the fridge to rise. Remove from fridge and warm to room temperature for 30 minutes before baking. 4. FREEZER OPTION. Assemble pan, cover and freeze for up to a month in advance. Remove from freezer before you go to bed and let them rise overnight--ready to bake the next morning. FOR A SMALLER BATCH. Cut all of the ingredients in half to make 12 sticky buns instead of 24. 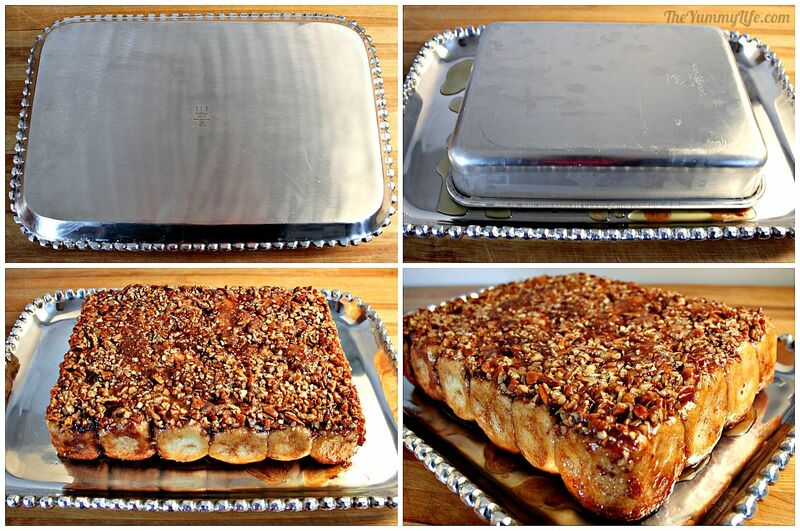 Assemble 12 sticky buns in an 8x8 baking dish, 9" deep dish pie plate, or 9" round cake pan (with 2" tall sides). Reduce the baking time by 5 minutes. I've been making this recipe for, gulp, over 35 years. (It stuns me that I'm old enough to have made a recipe for that long!) It's a version of a recipe shared with me by my college friend, Penny. She got it from her mother. So, if ever there's been a recipe that is tried-and-true, it's this one. This can be baked in several kinds of pans, but I have found a 9x13 pan results in the most evenly cooked, easy-to-serve sticky buns. 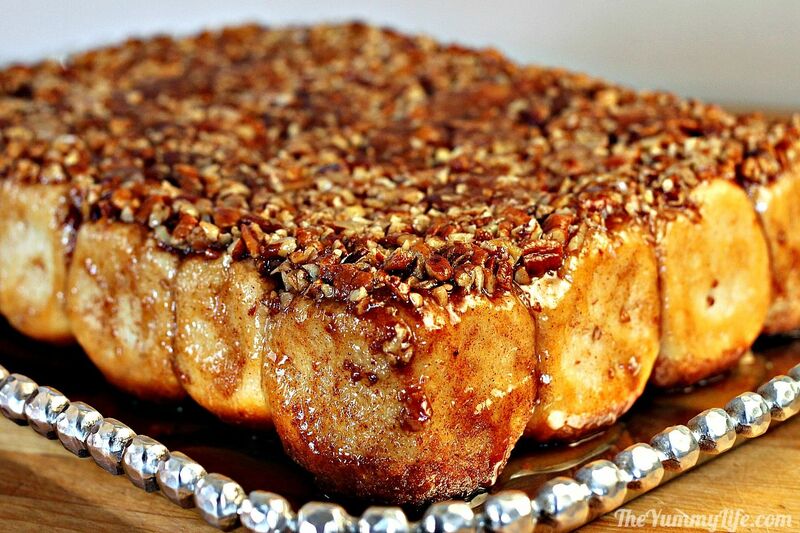 The original recipe was made in a bundt pan--some would call it monkey bread that way. I used a bundt pan for many years--it's pretty and festive that way. Either will work, but I recommend a 9x13 pan if you're feeding a crowd--it's much easier to serve, and every piece is equally good and evenly cooked. Speed scratch convenience. Speed scratch cooking is when you combine a good quality prepared food with fresh ingredients to make the recipe easier and faster to prepare. This recipe uses frozen bread dough. I suppose you could make your own bread dough from scratch, if that's your thing. But honestly, part of the beauty of this recipe is that you start with ready-made frozen bread dough and end up with something that is gooey and delicious and tastes like it is totally made from scratch. Make-ahead convenience. This is one of the best things about this recipe. It can be assembled the night before, left out to rise overnight, and baked for breakfast first thing in the morning. I've also discovered that I can make it 1 to 2 days ahead and let it do the rising INSIDE the fridge. That was a new concept for me--I thought that bread dough needed warmth in order to rise. Not so. It needs more time to rise in the fridge, but rise it does! I absolutely love being able to make this well in advance of when I will bake it. There is no preparation or stress that morning. It's perfect for serving to overnight guests, at brunches, and during the holidays. 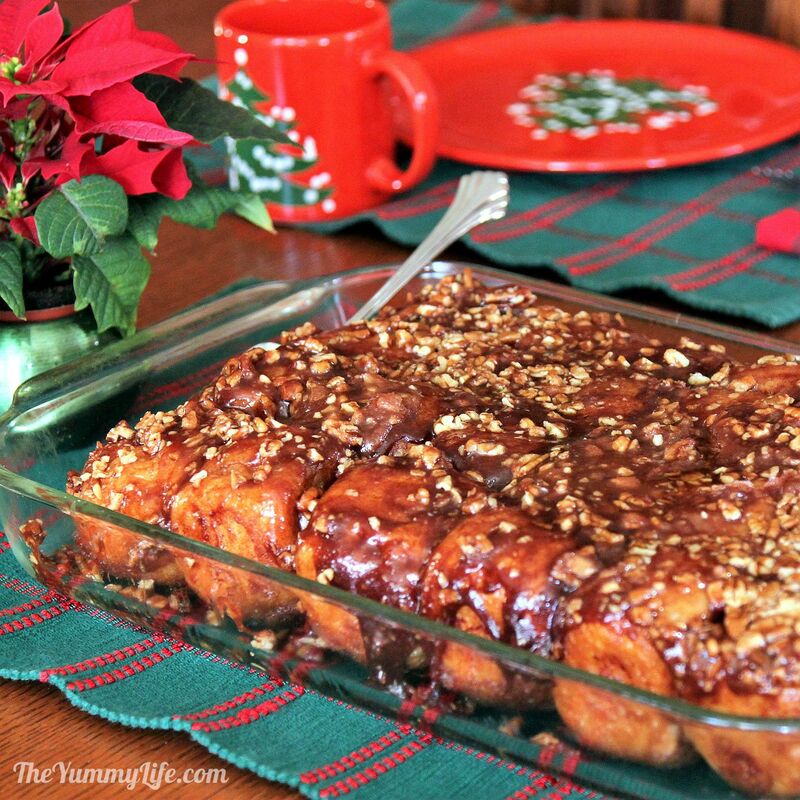 In our family, we have had these sticky buns every Christmas morning and other special occasions for, gulp, over 35 years. Impress the heck out of your guests. I'm always a bit taken aback by the raves I get from guests when I serve this. It looks hard, and tastes like it must have taken a long time to make. So, they're impressed. When I admit how easy it is, everyone wants the recipe. Here's a 1-minute video that shows you how simple it is to make these. Step 1. Assemble the ingredients. There aren't many: sugar, pecans (chopped or whole), cinnamon, and butter. You'll also need 2 pounds of frozen bread dough. (Any brand of frozen bread dough should work.) For years, I used 2 of Rhodes' frozen 1-pound loaves and cut each partially thawed loaf into 12 pieces. That works fine. 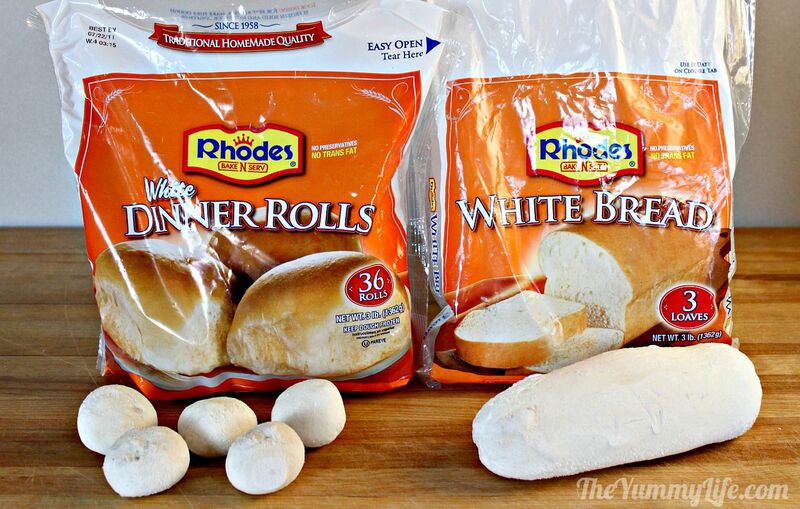 For added convenience in recent years, I've been using 24 of Rhodes' frozen dinner rolls--the exact same dough, but it's already in smaller portions and ready to use. Now that's speed scratching! Step 2. 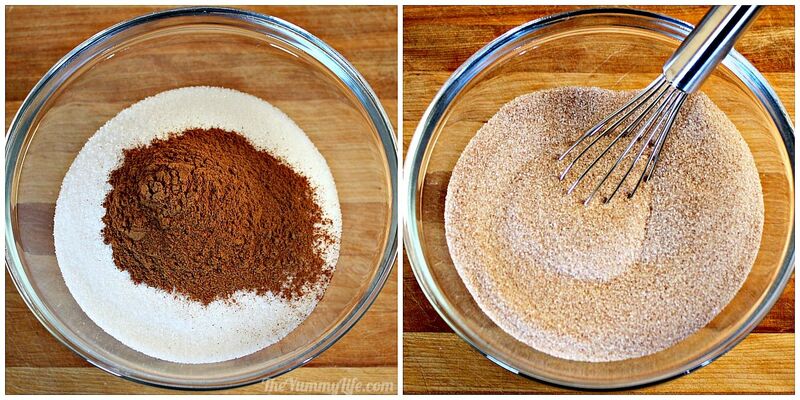 Whisk together the sugar and cinnamon. Step 3. 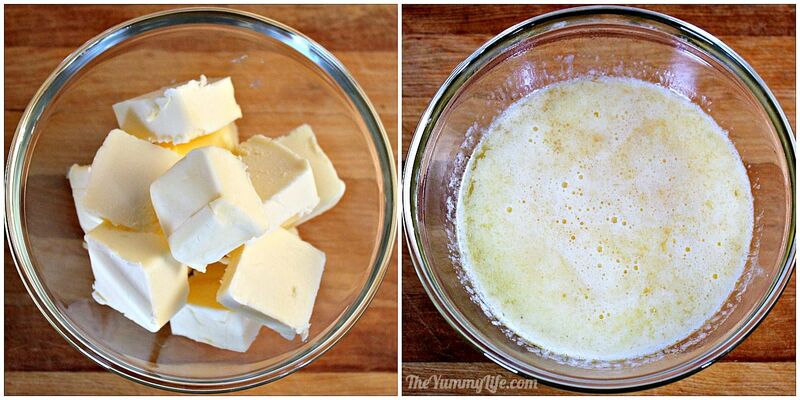 In a separate bowl, add the butter--cut it into a few pieces. Zap it in the microwave until it's melted. Step 4. 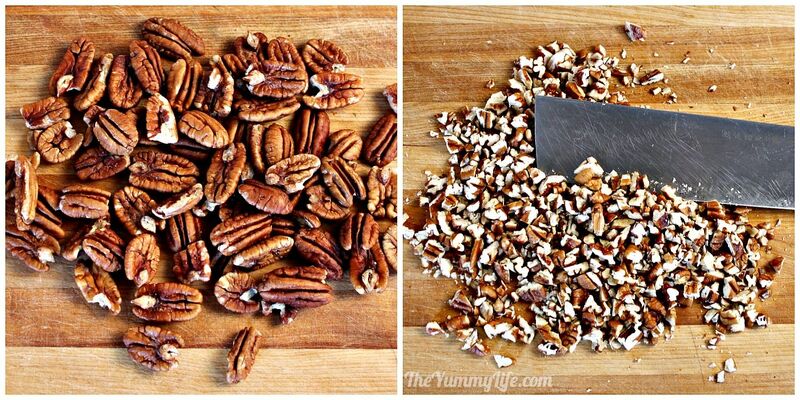 Chop the pecans (or purchase chopped pecans to begin with). Step 5. Butter a 9x13 glass or metal baking pan. Step 6. Sprinkle the pecans evenly into the bottom of the pan. 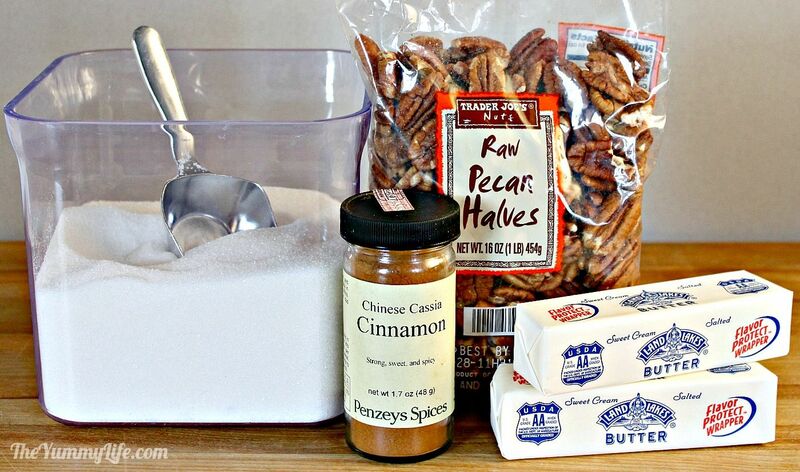 NOTE: If you have some no-nut eaters, just sprinkle the pecans over part of the pan. Step 7. 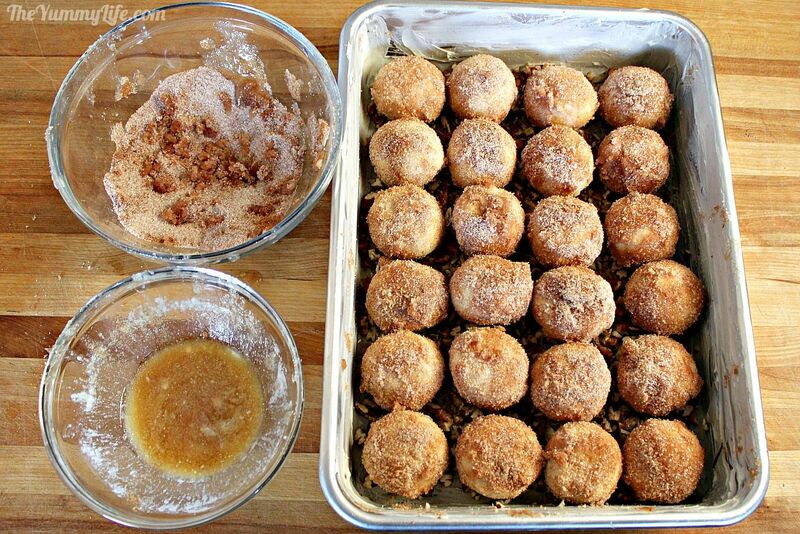 Set up an assembly line--the frozen rolls (or cut loaf pieces), melted butter, cinnamon/sugar, and pan with nuts. Step 8. Dip the frozen dough in melted butter. Step 9. Roll the dough in the cinnamon/sugar mixture. Coat it well on all sides. Step 10. Place the dough pieces in the pan in even rows. Step 11. Combine the remaining butter and cinnamon/sugar. If the butter has started to harden, zap it for a few seconds in the microwave to liquefy it again. Stir it. Step 12. 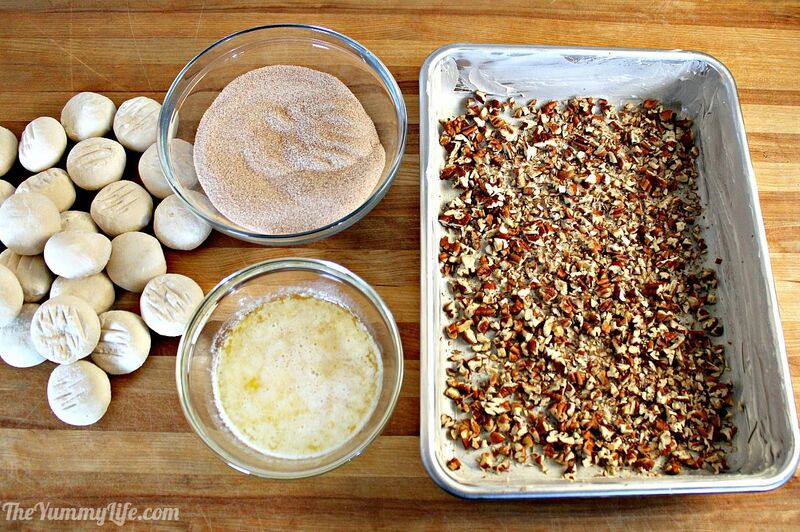 Spoon the mixture evenly over each piece of dough. Step 13. Cover with plastic wrap that has been coated with cooking spray. If left out, it will normally take 8 hours for the frozen sticky buns to rise in a 72 degree F room. Assemble the pan before going to bed, let it rise overnight, and it's ready to bake in the morning. Put the pan in the fridge to partially rise for 20-24 hours. Remove it from the fridge and let it rise for another 2-3 hours at room temperature. This is the way I prepared the sticky buns for a baby shower brunch. The brunch was at 10 am; so I assembled the pan at 8 am the morning before the brunch, covered and put it in the fridge, removed it from the fridge the next morning at 6 am and let the buns rise at room temperature until I baked them at 9 am. Put the pan in the fridge for 44-48 hours. That's what I did with this batch--assembled them Friday morning, baked them Sunday morning. The photos below show what the pan looked like when I took it out of the fridge after 44 hours. I let the pan warm to room temperature for 30 minutes, and it was ready to bake. FREEZER OPTION. You can also assemble a pan of these, cover and freeze them for up to a month in advance. I often do this before a busy holiday. Simply remove them from the freezer before you go to bed and let them rise overnight--ready to bake the next morning. Step 15. Bake for 40-45 minutes until browned and done in the center. I put a loose sheet of foil across the top during the last 10 minutes of baking, because my oven tends to over brown things. Keep an eye on yours, that may or may not be necessary. DONENESS TIP: For extra insurance that the center sticky buns are cooked completely but not overcooked, insert an instant-read thermometer half way inside a center bun. The internal temperature should be 190-200°F. I highly recommend my Thermapen Mk4 by Thermoworks--it's fast, accurate and the choice of chefs. I use it for so much more than testing meat (or sticky buns!) --like bread, casseroles, candy, and even water. Cooking to a desired internal temperature removes any guesswork about when your food is perfectly cooked. This is one of my favorite, most-used kitchen gadgets. The baked buns have satisfying textures. The crusty sugar you see on top has a crunchy, streusel-type texture and taste. The butter melts down and mixes with the nuts and sugar on the bottom of the pan and makes a caramely syrup. So, they're both crunchy and gooey. Step 16. 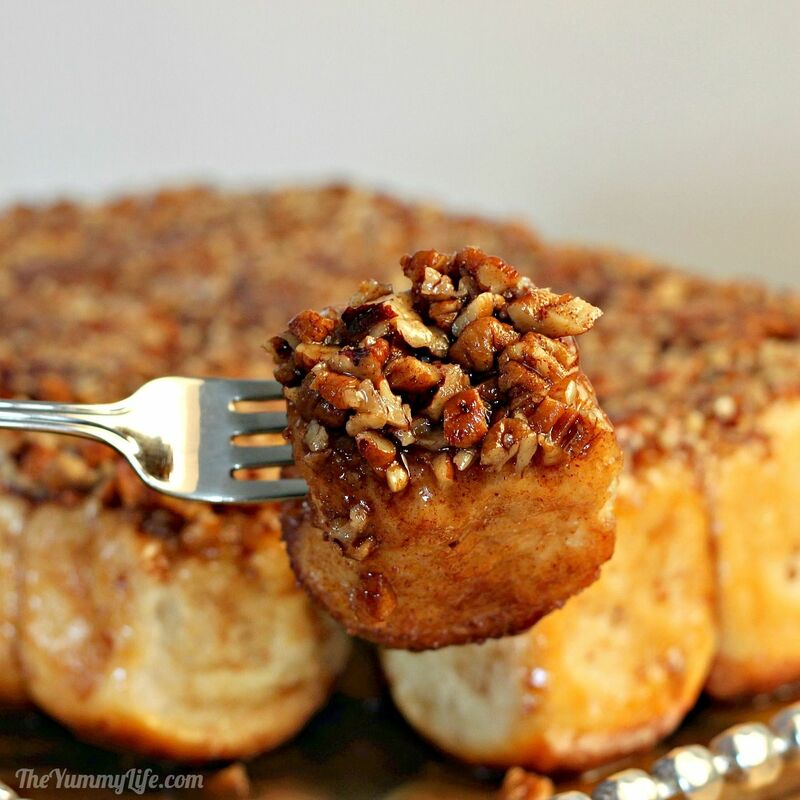 Let the sticky buns rest in the pan for 5 minutes after removing them from the oven. Then put the serving tray on top of the pan and quickly flip the tray and pan over (carefully--the pan is hot!). Lift off the pan, and TA-DAH, beautiful, gooey, delicious sticky buns! Now all that's left is digging in and eating these gooey delights. Serve them warm--they're so much better that way. Want to make a smaller batch? 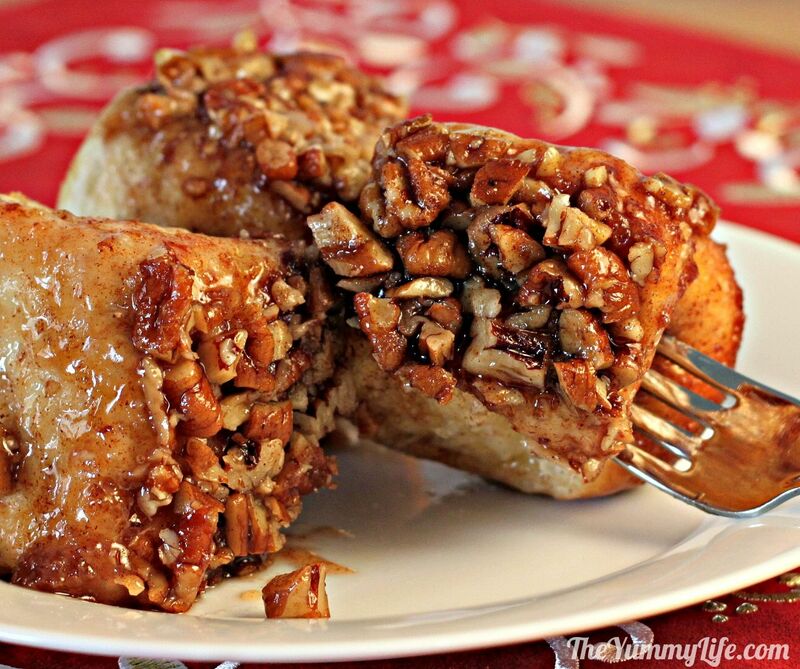 Simply cut all of the ingredients in half to make 12 sticky buns instead of 24. You can bake 12 sticky buns in an 8x8 baking dish, 9" deep dish pie plate, or 9" round cake pan (with 2"tall sides). Reduce the baking time by 5 minutes for a smaller batch. If you have leftovers (unlikely, I know), it's easy to reheat a serving of sticky buns by zapping them in the microwave for 15-20 seconds.